We are a week into the season and a bunch of resources, examples, and documents have been published about the game. We're also giving links to some of the robots we have been looking at that have inspired us so far. Combined Team Updates PDF- Updates are published every Tuesday and Thursday. If you have specific robot or rules questions its better to ask a mentor team then the Q&A. Then where you think there might be two interruptions of a rule or corner cases for a rule that is when you should ask the Q&A for clarification. Reading the Q&A is a good way to see how the rules will be enforced and get some ideas of how the game may be played. This is for making sure our alliance partners don't slip down our forks while we lift them up into the air. The test robot there is our 2013 bare chassis with multiple weights, a vise and a broken arbor press mounted on top. It weighs in at 143 lbs. 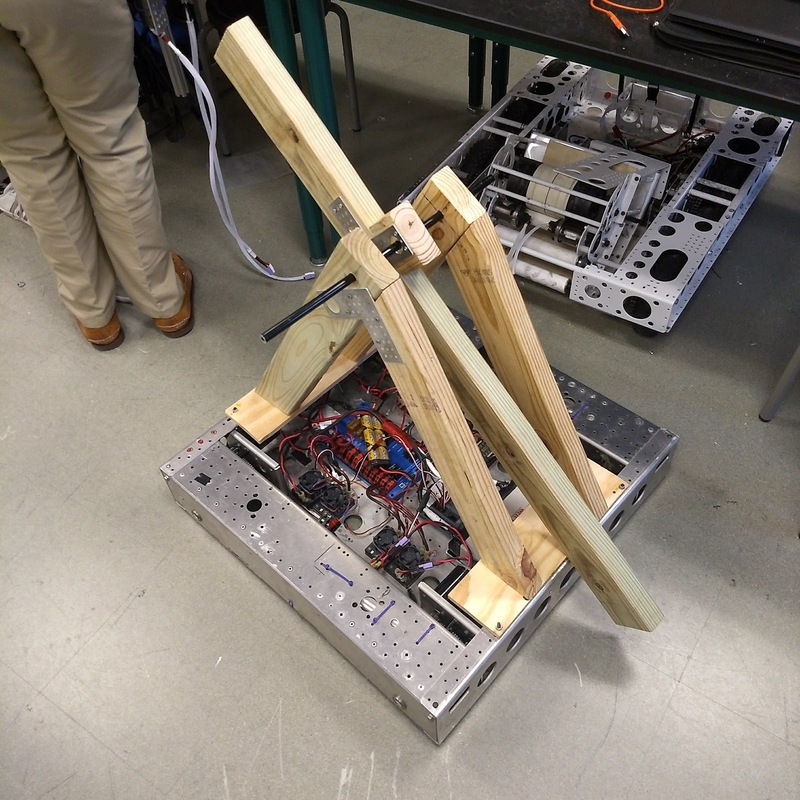 If we can lift this we can lift nearly any robot this year (CG could be an issue with some very tall robots). Inspired by the 1538-2015 intake we have a team looking at a double 4 bar intake. 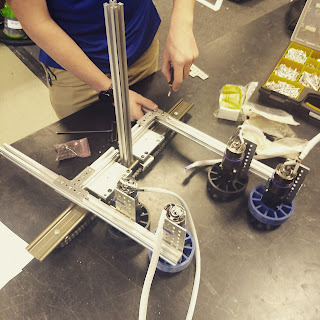 If we finalize on this, our robot could have a large arm joint, a telescoping extension, 2 four bars, and a wheeled shooter we are pretty sure that wins us FRC Bingo (1323's 2012 robot with a turreted shooter on a four bar is close though). 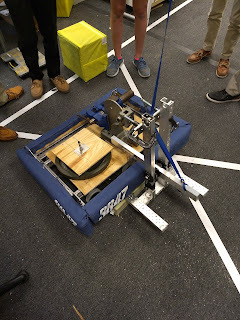 This intake uses linear rails and chain linking the two arms together to keep them centered to allow the intake to adjust to the different cube geometries. We'd have a pneumatic actuator to open the claw to make mid field cube acquisition easier. We noticed the cubes like to slide away form a lot of intake if you don't have a wall behind you. We are converting our 2014 practice chassis into a prototype for this robot. Mainly because it's 28" long just like our current planned robot. 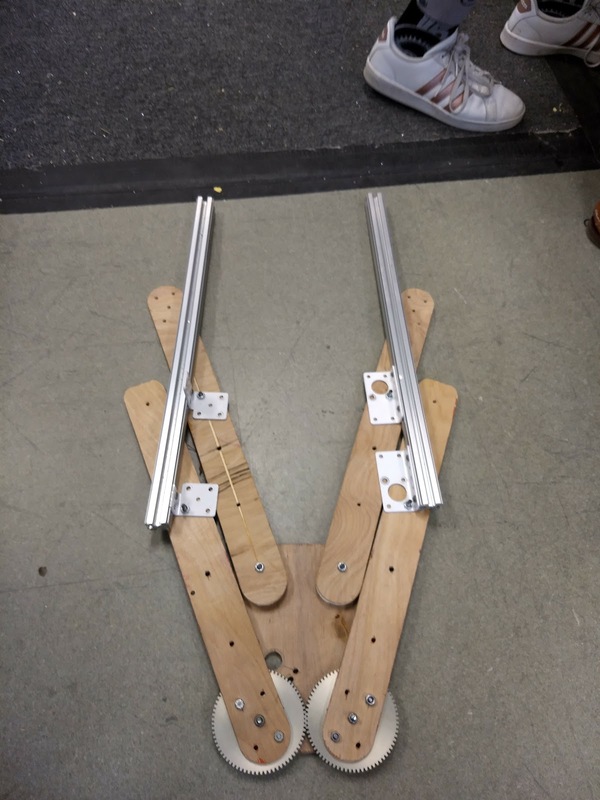 We added a quick 2x4 A frame and Arm mock up to lets us see the geometry that we are working with. The shoulder joint is off axis with the arm to allow the extension to go through the joint without having to two separate pivot arms clamped around the extension tube like 233 and 2168 example arms. This will present slightly different heights to each side of the arm's motion but with much of this game relying on imprecise movement (place a box in a 3' by 4' plate) it shouldn't effect us too much. We get to do a lot of robots over the next 3 days so we should have more test video up in the next few blog posts.